The garage door specialist in the Gravenhurst area. When you drive or walk around Gravenhurst, you will note the architecture is pretty much the same in the different neighborhoods. The main design is traditional. Naturally, you want your garage door to fit your style perfectly, and we have something for you. Check out our image gallery to get a closer look at what we can offer. No matter when you have an emergency for your garage door, you can count on us. Jessco Overhead Doors is available around the clock for emergency services. If you need a garage door repair in Gravenhurst, ON, you can fill out our online form, or you can call 705-325-2568. We can provide help including Gravenhurst, Orillia, Barrie and more. 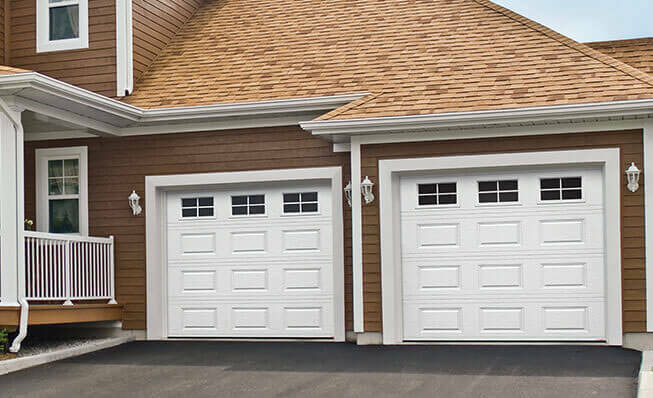 Our specialty is garage doors, and we carry replacement parts for repairs, and we can also help for the exterior design of your garage door as well to make it truly your own. Whether you need a panel replaced, have broken springs or you need a garage door openers, we can help. A quality Garaga door that’s insulated is an excellent choice. It can keep your home safe from the elements no matter the time of year. Do you want energy efficiency? The Standard+ and the Cambridge offer R‑16 thermal resistance so they would be great choices. LiftMaster garage door openers are the best products if you need a new garage door opener for your garage door system. They are easy to use and reliable. We can provide you with openers for residences, commercial spaces, and we can also provide industrial garage doors.